Oliebol, a traditional New Years Eve dish. On New Years Eve the Dutch people eat, by tradition, a lot of Oliebollen. In the month december you can buy them everywhere. Oliebollen are sold in stands, bakery’s, supermarkets or you can make them at home. An Oliebol has the size of een orange and is eaten with a lot of powdered sugar. 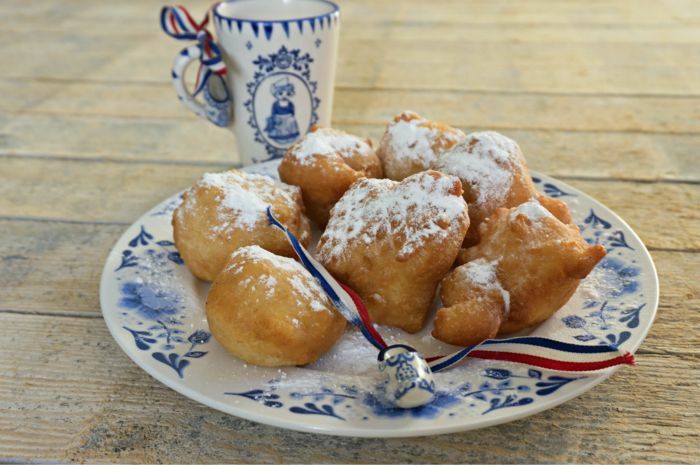 The Oliebol is fried in sunflower oil in a big frying pan and its not unhealty to eat them. Here we have the Oliebollen recipe to make your own Oliebol. Enjoy making and baking the Oliebol and most of all enjoy to eat the Oliebol. Wash the raisins, and let them dry out. Crumble the fresh yeast, mix it with the sugar and 1dl (100ml!) tepid milk in a bowl, and stir until it’s a nice smooth mixture. If you dont have any fresh yeast just use the dryed yeast at the same way. Mix the flower with the salt in a big bowl. Make a little hole in the centre, and pour the yeast mixture into it. After that add the (tepid)milk that is left into the same hole. Mix it with a hand blender or a spoon until it’s a nice smooth mixture. Mix the grated lemon peel, the apple pieces (with the lemon juice), the raisins, the chopped candied peel and the cinnamon into the mixture. Cover the bowl with some foil and let the batter stand (rise) for about an hour on warm spot. Heat the sunflower oil until it reaches 180ºC. Now, you can do the next step with a soup spoon (a deep big one). Stick the spoon in the heated fat for a couple of seconds; this will prevent the batter from sticking to the spoon. Use the spoon just as you would use it to serve soup. Make sure the spoon is filled with the batter, and carefully dip it into the oil. Repeat this, but don’t have more than 4 of them into the oil at the same time (this also depends on the size of your pan). Fry the ‘oliebollen’ for about 8-10 minutes until they are nice gold brownish. Rotate the them with a fork after 4 minutes, so the whole thing gets fried equally. Repeat this step until the all of the batter is used. Let the ‘Oliebollen’ dry out on some kitchen paper before you serve them. Arrange them on a nice dish and don’t forget the powdered sugar! If you don’t like raisins, apples or candied peel, you can leave it out. You can eat an Oliebol hot or cold, we like them hot the most. Save them in a refrigerator and heat them in your oven the next day. After you fried the Oliebollen, let them leak out and cut them open. You can stuff them with whipped cream, strawberries or whatever you prefer. This is not the traditional way to eat an Oliebol but if you like it? Why not. Don’t you like to make the batter? There are special packs “Oliebollen mix” available. Just add water, stirr and let it rise on a hot spot and the batter is finished. This recipe for Oliebollen or also called Airballs are fryed in the Airfryer. The recipe is from The Philips Master. An Airfryer is a kind of oven that works on hotair, it is used for baking with less oil than normaly. If possible, do all ingredients in the bowl of the Kitchen Machine and make the dough with the kneeding hook. Let rise for 1 hour with help of a wet cloth over the bowl. Squeeze balls with a medium size icecream spoon and roll it into the flour / powdered sugar mixture. 10 minutes 200 Gr Celcius brown. After 5 minutes, just turn the Airballs. When you want it you can spray them with some sunflower oil for give them more color. Enjoy youre Oliebol of when you made it in the Airfryer, enjoy youre Airball. If you can’t buy Koopmans Oliebollen Mix in youre country, you can sent me a message and I can send it to you.